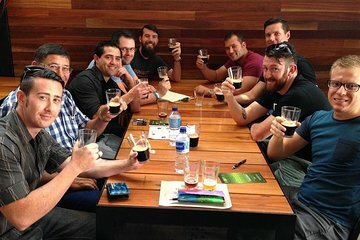 Visit four craft breweries in Brisbane on a 6-hour tour that introduces you to some of the city's best suds. Drink a variety of handcrafted beers and soak it up with a tasty lunch while learning about the beer-making process. If you're lucky you can go behind the scenes and meet the brewmasters. Stops usually include Newstead Brewing Co, Green Beacon Hipwood Brewing Co. and All Inn. Your expert guide is a beer lover who shares informative commentary and entertaining stories throughout your tour. Meet your guide at the designated spot in either downtown Brisbane or Fortitude Valley, then step aboard the comfortable minicoach to go to your first brewery. Your first and second stops take in Newstead Brewing Co and Green Beacon. Sample a variety of their core beers, such as a session ale, porter or IPA, and perhaps try a few seasonal brews as availability allows. By the time you head to your second destination, you might have worked up an appetite. You can start with a tasting paddle of beer, then enjoy a tasty lunch at the historic Hipwood Brewery at the International Hotel. Wrap up your sudsy day with several more tastings of the great brews at All Inn Brewing Co. Sip their standard beers and try new ones that they have just introduced. If the brewery schedules allow, your guide will introduce you to some of the brewers and you might even get a look at their brewing facilities. At the end of your leisurely beer tasting tour, return to the city center where you are dropped off at a conveniently located local pub. Please note: Your tour operator makes an effort to catch the brewers in action, but it cannot be guaranteed. Locations are subject to change. No matter what, you will sample great beers in Brisbane's vibrant brewery scene.